My Creative View: New things! I've been busy again....but scrapping this time! I have quite a few Layouts to post, but for now I'll start with this one. I will add more later. I won't keep you, so here goes. This next one is for both ScrapFit and Frosted Designs. 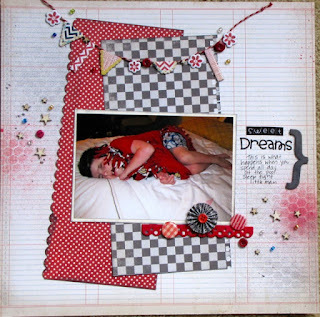 I used the sketch from ScrapFit, and the misting with stencils from Frosted Designs. I'm thrilled with how it came out! I was stuck on how to do this photo. He CRASHED in the hotel room after being outside at the poo ALL DAY! I just didn't know which direction I wanted to take with the design and papers. Enter challenge blogs! The sketch was great. It was simple enough, but with lots of leeway to play and make it my own. Well, mist was a great way to make it my own! Besides, mist seems to make an appearance on many of my pages lately. I love the variety of ways mist can change a page. I used some bitty things as well as a banner. Sweet? Maybe. He may be a boy, but there is nothing sweeter than a child sleeping. Papers are all MyMinds Eye. Banner chipboard is Basic Grey. Twine is also MME. Tattered Angels mist. Crafters Workshop stencil. 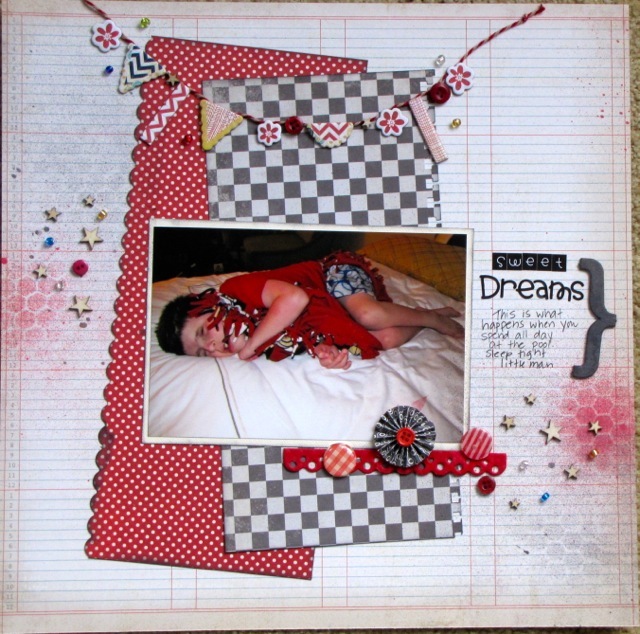 AC buttons and paper flower, Doodlebug alpha stickers, Studio Calico stars. Beads are from Fred Meyer market! love your take on the sketch, great misting too, thanks for joining us at scrapfit! What a sweet sleepy boy!! I love the banner and the misting on your layout!! Thanks for joining us this week at Frosted Designs!! Great take on the sketch! I love the colors you used and all those cute little embellishments. Thanks for working out with us at ScrapFIT!.